How can I contact Chessington Holidays? We offer a range of convenient ways to get in touch on our Help Centre. Our opening hours are: Monday — Friday: 9am - 9pm and Weekends: 9am - 5:30pm. What are the opening times for 2018? Please check Chessington World of Adventures for opening times. How do I book ticket only? To book ticket only, please visit Chessington's website or call 0871 663 4477 (Calls cost 13p per minute plus your phone company's access charge). If you are a Merlin Annual Pass holder, you can book a bed and breakfast package via our Annual Pass Holder page. What is included in the Chessington Holidays package? Total cost for whole party prices include your park tickets, hotel stay, entrance to SEA LIFE centre and Zoo, parking and breakfast at hotels is free unless otherwise stated in the 'more info' section. 2nd Day FREE does not apply to Merlin Annual Pass or Winter Breaks packages. Can I get a Chessington hotel deal with a Merlin Annual Pass? We have special bed and breakfast rates for Merlin Annual Pass Holders – find out more. How much is ticket only compared to package cost? This depends as prices change throughout the season. Our standard ticket and hotel packages give a family of 4 2 day park tickets, overnight hotel stay and breakfast. As we can sell you a Chessington package, not only can you travel safe in the knowledge that everything is arranged, but we're able to negotiate the best deals for you, the customer. Often our prices start from less than the price of a family ticket at the gate. Your confirmation will be sent to the e-mail address you enter at the time of booking. The email confirmation will include your print at home tickets with barcodes in a PDF attachment. What is the ticket procedure for entering the park? Your email confirmation and PDF attachment will contain your bar-coded Chessington ticket's. Please open the attachment, print the tickets and your confirmation email before leaving home and take these with you on your trip. On arrival at Chessington simply take the tickets to the turnstiles where the bar codes on the tickets will be scanned to allow entry to the Park where your adventure will begin. I have discount vouchers, am I able to pre-book with these? No, we do not have the facility to accept promotional ticket only vouchers such as 2 for 1 promotional offers or any other ticket only discount vouchers. To take advantage of these you would need to pay locally. Does Chessington Holidays offer any corporate discounts? To find out about corporate discounts please call our Customer Experience Team on 08710 971 226 (calls cost 13p per minute plus your phone company's access charge). Upon entry to the park, is it necessary to pay for the rides? Your ticket will include access to all of rides and attractions at Chessington World Of Adventures Resort. Games, gift shops, restaurants and individual stalls incur an additional charge. How much is the package per person? Prices vary throughout the season and are subject to availability. Have you got any special offers? When is the Kids Go FREE offer available? This is available on selected dates throughout the season. Check the special offers page for more information or sign up to our newsletter for the latest events and offers information. What is the cheapest time to come to Chessington World of Adventures Resort? Our prices vary depending on the time of year. If you book outside of school holidays you'll often find that prices are less and the park is emptier meaning you can avoid the queues! If you're flexible on dates then keep an eye out for our special offers running throughout the year that often apply to specific off-peak stay dates. What is the family room layout? The family room layout differs according to each hotel and this can be found on the 'more info' for the individual hotel when making a booking. Rooms usually consist of a double bed plus bunk beds or a double bed with a separate kids sleeping area. Does Chessington World Of Adventures Resort have any onsite hotels? There are two onsite hotels at Chessington World of Adventures Resort called the Chessington Safari Hotel and the Chessington Azteca Hotel, which are situated within the theme park grounds. However, there is a great selection of hotels within an 8 mile radius of the Theme Park. At what time can I check into my hotel? Each hotels check-in time varies, please click on the 'more info' option which is available when you select a specific hotel. Your check-in details will also be displayed on your email confirmation. Yes, we provide upgradable rooms at the Chessington Safari Hotel called African Adventure rooms. You will need to reserve these rooms at the point of booking. You may not be able to purchase these locally as these rooms are very popular. You can also upgrade to the Chessington Azteca Hotel rooms or a DreamWorks Penguins of Madagascar themed room. For offsite hotels you would need to do this upon arrival at the hotel and you would need to pay for any additional costs locally. All room upgrades are subject to availability. With regret, Chessington Holidays are unable to guarantee room upgrades for offsite hotels. By calling our Contact Centre on 08710 971 226 (Calls cost 13p per minute plus your phone company's access charge). Most hotel rooms can accommodate a cot, however, please call our Contact Centre to confirm that the hotel you are booking can accommodate a cot in the room type selected. All cots are subject to availability and linen is not provided. Parking is available at all of the hotels, however there may be a small charge. Please check the 'more info' section of each hotel. What do I do if I have not received my confirmation? If you have still not received this 24 hours after booking your break, please call us on 01303 490037 and we will ensure this gets re-sent to you. Calls cost 10p per minute plus network extras. I do not have email, how will I receive my confirmation? Please get in touch via our Help Centre and we will arrange for your confirmation and tickets to be posted to you. What do I do if I am experiencing problems booking online? Please get in touch via our Help Centre and one of our friendly UK based reservations team will be happy to process your booking for you. Why has the price increased since my first search? Chessington Holidays is committed to providing the best choice of product, at great prices, so throughout the season we continually review our products and prices. There are likely to be some seasonal special offers and in some circumstances prices may go up or down depending on availability. 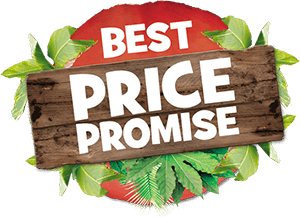 The price of your chosen package will be confirmed at the time of booking but may change if you do not confirm your booking straight after you receive your quote. All prices are subject to change and availability. Full payment will be taken at the end of the booking process by either a credit or debit card. We accept Visa, MasterCard, Visa Debit (Delta), Visa Electron and Paypal. Both Chessington Holidays and Chessington World of Adventures Resort are unable to accept personal cheques. Please note: Chessington Holidays uses the merchant ID 'hex*chessingtonholiday' or 'HXPAYMENTS'. Once you have made your booking and payment has been taken from your account, 'hex*chessingtonholiday' or 'HXPAYMENTS' will appear on your bank account statement alongside the amount taken for your booking. Can I pay a deposit for my Chessington Holiday? Unfortunately not. The balance must be paid in full at the time of booking. What are the cancellation charges if I cancel my booking? Our cancellation charges are a percentage of your total booking cost. Cancellations must be made by calling our Customer Experience Team on 08710 971 226 during our opening hours of 09:00 — 20:00 Mondays — Fridays and 09:00 — 17:30 on weekends. Calls cost 13p per minute plus your phone company's access charge. Cancellation requests via email, letter, fax or voicemail will not be processed. *Cancellations made before 8pm (5:30pm on weekends and bank holidays) on the date of purchase attract no cancellation charges (unless your stay date is within 36 hours of the date of your ticket entrance to Chessington World of Adventures or the date of your hotel stay (whichever is the earlier), in which case 100% cancellation fees will apply). How can I avoid paying any cancellation charges if I need to cancel my booking? We are pleased to be able to offer cancellation cover for a small fee when you book your Chessington break with us. For just £9.95, our cover allows you the freedom to cancel your booking without penalty and obtain a full refund up to 36 hours before your break. To do this you must contact us by telephone at least 36 hours before the date of your stay. Should you wish to make any changes to your confirmed break, you must notify us as soon as possible. Whilst we will endeavour to assist, we cannot guarantee we will be able to meet any such requests. Please be aware amendments may incur an additional charge. All amendments must be made through Holiday Extras, please call on 01303 490037. Any alteration requested within 24 hours of the date of ticket entrance to Chessington or within 24 hours of the hotel stay will be treated as a cancellation by you and you will have to pay the cancellation charges. Simply go to 'My Booking' at the top of the screen and choose to resend your booking confirmation straight to your inbox, after filling in a few easy questions about your booking. How do I get directions to my hotel? This information will be available on your confirmation and there is also a map available on our website. It is your responsibility to bring correct directions or a map with you on your trip, we cannot be held liable for any failure to get to the hotel. How can I get to Chessington? Chessington World of Adventures Resort is located on the A243 in Surrey and is just two miles from the A3 and M25. For more information on the different ways to travel to Chessington, see our page on travelling to Chessington. How much does a taxi cost to Chessington? The cost of a taxi to and from Chessington will vary from different hotels. We suggest you contact the hotel booked directly on the telephone number provided on your booking confirmation. Do Chessington charge for parking? Parking is charged at £3 per car at Chessington. Paid parking has been introduced to bring Chessington World Of Adventures Resort inline with the other Merlin theme parks. It is also a great opportunity for re-investment to improve the infrastructure of the car parks. Each vehicle parking in our car parks requires a daily parking ticket. There are no exceptions apart from Merlin Premium Pass holders, guests staying at the Chessington Resort Hotels and using the hotel car park, cars with a guest with a disability, taxis, buses and bicycles. Guests should purchase their car parking tickets before leaving the park. Car parking tickets can be purchased from Lodge Gate, Explorer Gate or the VIP HUB. Premium Merlin Annual pass holders receive complimentary Car Parking. Are there any height restrictions in the car park? There are no height restrictions in the car park. What are the in-park facilities? Toilets, food, baby change, buggy hire, cash points, free wheelchair hire. Does Chessington cater for alternative dietary requirements? The restaurants in the Chessington World of Adventures Theme Park do not currently offer Halal or Kosher food. However, there are many vegetarian alternatives or you are welcome to bring a picnic. Chessington Resort is fully accessible to wheelchair users and wheelchairs are available to hire. For full information relating to individual rides please see Chessington's guide for guests with a disability. Please click here for full details of the rides which carry a restriction. Waiting times are posted at the main attractions to enable you to plan your day. Are there any shops in the park? Special retail shops and carts are located throughout the park. Chessington is predominantly an outside attraction with many rides outside. Some rides and attractions may close in cases of high winds, thunder or lightning due to health and safety. There is also a selection of indoor attractions and activities. Chessington World Of Adventures Resort and Chessington Holidays regret that refunds will not be issued due to inclement weather. If you come prepared you will still have a great day! Can we enter and exit the park throughout the day? If you wish to leave the park and return the same day, at no charge, please have your hand stamped at the entrance turnstiles. Failure to obtain a hand stamp will result in you not being re-admitted. Your ticket is not proof of re-entry. Do over 60's get a discount? As our prices are competitive there is no further discount or concessions available for over 60's. What is the park's smoking policy? Chessington has prohibited smoking within the park. Designated smoking areas are available for guests that choose to smoke during their visit. Who do I contact if I have lost property at Chessington? Please report any lost items to Guest Help & Information in Adventure Point. Alternatively, you can submit a lost property request form. You are able to contact Chessington World Of Adventures Resort 0871 663 4477. Calls cost 10p per minute plus network extras. Chessnigton Resort is part of Merlin's Magic Wand, the charity set up by the parent company, Merlin Entertainments Group, to provide magical experiences for seriously ill, disabled or disadvantaged children. Click here to find out more about Merlin's Magic Wand. Chessington Resort can only offer support to a small number of requests within the immediate locality of the Theme Park. To make a request, please fill out a charity request form.